The Labino White Lights / Lamps & LED Torches / Flashlights - For applications such as Crime Scene Investigation, Forensic evidence collection and more. Labino MPXL White Lights The Labino MPXL White lamps have a unique white luminance - makes it possible to see things that have not been possible before! The Labino MPXL White Lights are available in three beam profiles - Floodlight, Midlight or Spotlight; each giving different beams and intensities. The Spotlight has the greatest focus and is the most intense. The Floodlight has the widest beam but a lower intensity. The Midlight is in between. The Labino MPXL White Light Lamps obtains full power in 5-15 seconds and can be switched on and off whenever used, without pre-cooling. You can use the lamp outdoors, even in the rain, as the lamp is IP65 certified. Floodlight Distribution angle: approx. 45 degrees Luminous flux: 3,500 Lm Midlight Distribution angle: approx 20 degrees Luminous flux: 3,500 Lm Spotlight Distribution angle: approx. 3.5 degrees Luminous flux: 3,500 Lm Intensity approx. 250,000 cd at 2500 mm Available in a variety of case styles to suit your needs. 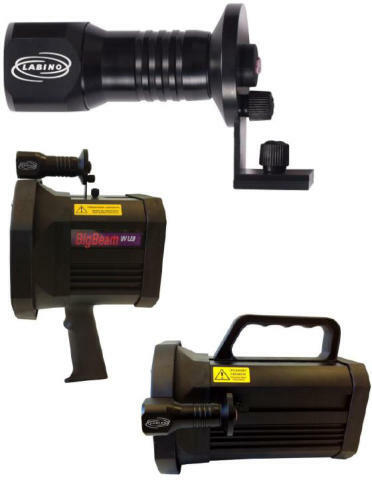 Labino LED White Lights & Torches Labino Torch Light W - White Light 10,000 Lux at 1 meter - 211 gram The Labino Torch Light W is a small-sized, lightweight, white light flash-light.This Torch Light is perfect for general industrial use and as a search light in crime scene investigation. The Labino Torch Light W contains one (1) light emitting diode (LED). The LED creates more than 10,000 Lux (930 Foot Candle) at a distance of 1 meter (39.37 inches). The lamp measures 15.9 cm long (6.3 inches) and weighs 211 gram (7.4 oz), battery included. Full power is reached instantly. The on/off button is positioned in the back of the lamp to prevent accidental activation. At full charge the battery provides up to 4 hours of use. Recharge from a normal outlet or vehicle with included chargers. EnLiten - White LED After Inspection Light (add on optional accessory) Labino’s mission is to improve the working environment of the operative NDT engineer and create precise instruments that helps identify the defects. Labino now offers the first white light LED for after inspection especially designed for Standard Labino MPXL lights and all versions of the Labino BB range. The Labino EnLiten (L2001) is a small-sized, Lightweight white light LED lamp designed to be mounted on a Labino MPXL lamp or Labino BB. The Labino EnLiten is designed to be used as an after inspection light (to search for indications) performing NDT. The EnLiten lamp is easy to mount on your existing Labino BB or Standard MPXL light as it easily slides into one of the tracks on the side or on the top of the Lamp. The small white light accessory lamp is easily mounted on the MPXL or BB in a few minutes. The Labino EnLiten contains one(1) light emitting diode (LED). The LED creates more than 300 Lux (27.9 foot Candle) at a distance of 38cm (15 inches).Full power is reached instantly. The on/off button is positioned in the back of the lamp for easy activation. At full charge the battery provides up to 1.5 hours of use. Recharge from a normal outlet with the included chargers.(approx. 2hours). Weight including battery 121 grams. Labino LED White Lights & Torches Labino Torch Light W - White Light 10,000 Lux at 1 meter - 211 gram The Labino Torch Light W is a small- sized, lightweight, white light flash-light.This Torch Light is perfect for general industrial use and as a search light in crime scene investigation. The Labino Torch Light W contains one (1) light emitting diode (LED). The LED creates more than 10,000 Lux (930 Foot Candle) at a distance of 1 meter (39.37 inches). The lamp measures 15.9 cm long (6.3 inches) and weighs 211 gram (7.4 oz), battery included. Full power is reached instantly. The on/off button is positioned in the back of the lamp to prevent accidental activation. At full charge the battery provides up to 4 hours of use. Recharge from a normal outlet or vehicle with included chargers.